The Bipartisan Budget Act of 2018 (BBA) increased this year's discretionary spending caps by a whopping $143 billion, paving the way for a 13 percent spending boost in the recent omnibus bill. Some argue this spending increase simply reversed "sequester" spending cuts that neither side wanted. In reality, the BBA spent well in excess of that – busting the original bipartisan Budget Control Act (BCA) caps set in 2011 and spending well above any major proposal. In fact, the $1.21 trillion spent this year is over $50 billion above the original BCA caps, almost $80 billion above President Obama's final budget request, $115 billion above the recommendations of the bipartisan Simpson-Bowles commission, and more than $143 billion above President Trump's request. These large cap increases appear to be the result of a bidding war in which each side gave the other more than what it asked for. The budget deal and omnibus increased base defense spending by $80 billion, which is $26 billion (almost 50 percent) more than the increase President Trump requested. The non-defense spending increase meanwhile was $63 billion, which is $33 billion more than (over double) the increase President Obama's final budget called for in 2018. 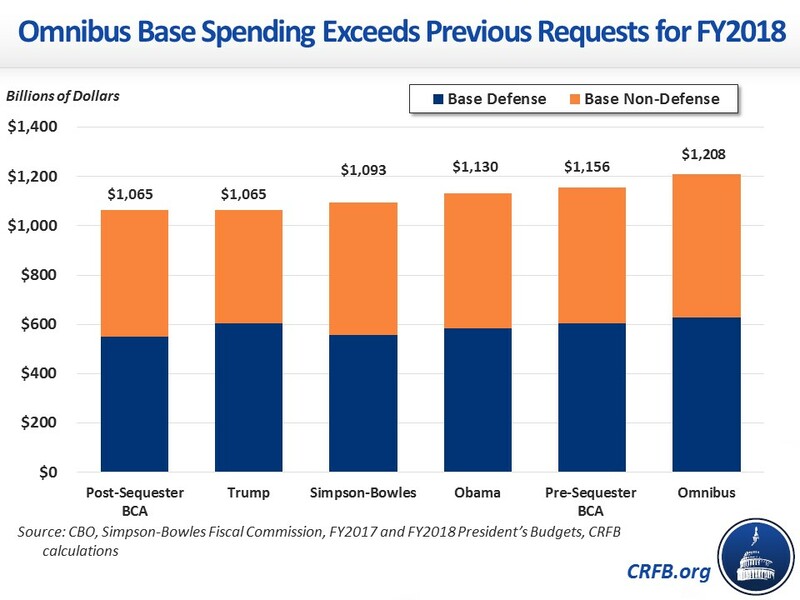 Both defense and non-defense spending is even further in excess of the Simpson-Bowles recommendations. Put simply, the BBA and omnibus increased discretionary spending by more than either side asked for. And because it wasn't paid for, the BBA increased the deficit by $320 billion and set the stage for a $1.7 trillion increase if the bill is extended without offsets. Update 4/14: Clarified phrasing and corrected a percentage. The non-defense increase is more than double Obama's proposed increase, rather than 70 percent higher.